On my travels in the Southwest, I’ve seen quite a few petroglyphs: illustrations chipped or carved into the surface of the rock. Two days ago in Sego Canyon, I saw some of my first pictographs: rock art painted onto the wall using natural pigments. 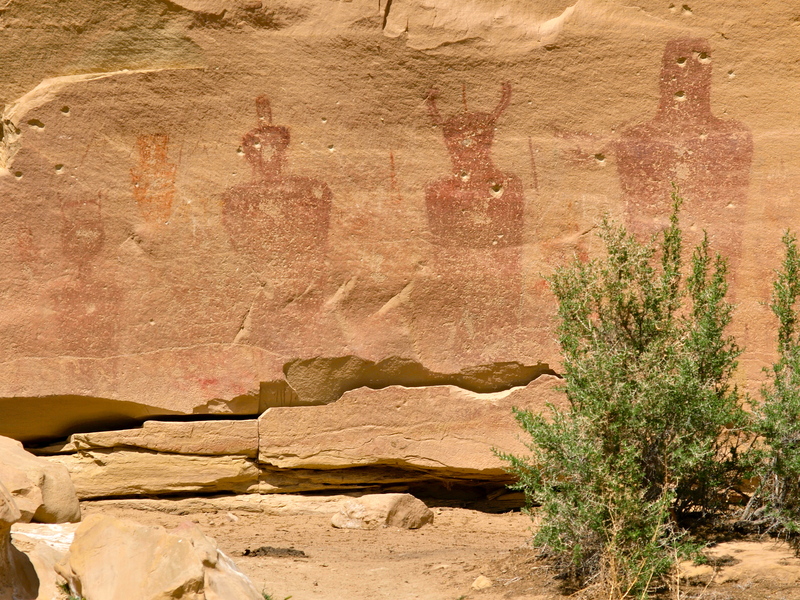 These paintings, known as Barrier Canyon Style, were created 8,000 years ago (!) by little-known nomads called the Archaic People. 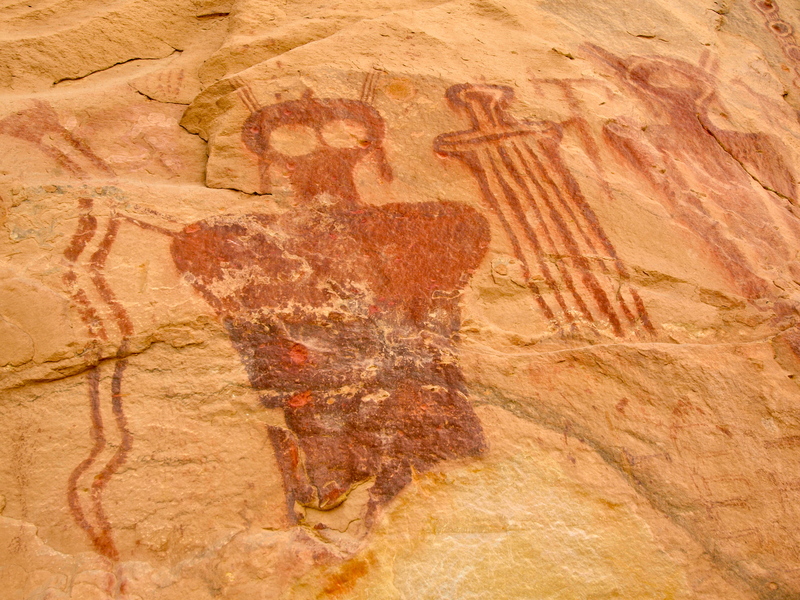 Barrier Canyon Style is identified by larger than life anthropomorphic forms, usually with hollowed or missing eyes, an absence of arms and legs, and horns, antennae, earrings, and snakes. 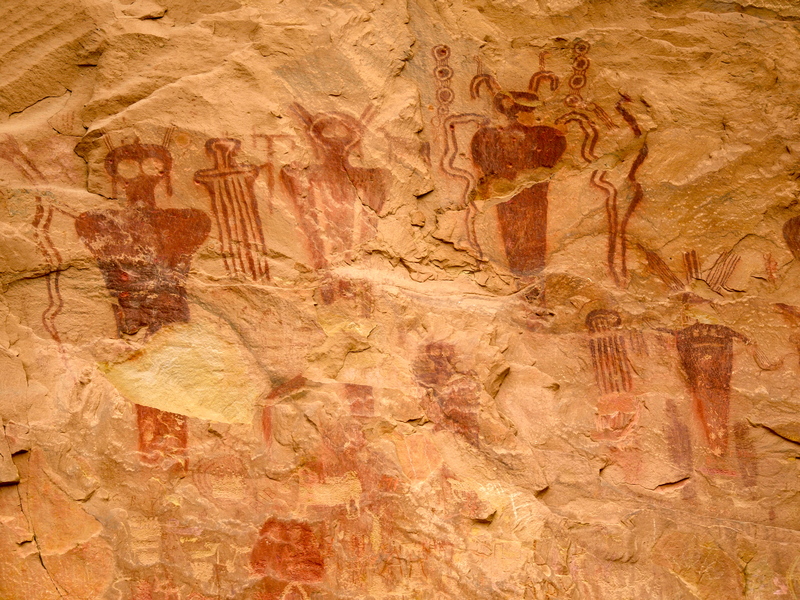 The ghostly red images are thought to represent shamanistic art associated with ritual activities of the Archaic people. Ghosts of Sego Canyon. Note the bullet holes. This entry was posted in Hiking!, Photography, Road tripping!, Uncategorized, Vagabonding 101. Bookmark the permalink. We had the pleasure of viewing some of these in person in 2009 and every time we saw some the children became more convinced that the ancient peoples had been visited by aliens. I am new to the world of blogs but yours is the best I have found so far. I am enjoying sharing it with my eleven year-old, Maggie, a feisty girl often frustrated by the shopping obsessed girly girls who seem to abound in our town and her school. It is so good to be able to inspire her with your blog. We hope to return to the SouthWest in 2014 and your blog will be an invaluable guide. Thanks! Very awe-inspiring and thought provoking.I hope to see them for myself one of these days. I never tire of seeing petroglyphs and pictographs of any kind. But the unique and unusual keeps the excitement fresh! I’ve been there. Pretty awesome – glad to see someone else interested in one of my nerdy interests.